In the not-too-distant past, Cadillac vehicles staring with the letter C – think Cimarron and Catera, were hardly memorable choices. The launch of the original CTS, in 2001, started what was to become nothing short of an amazing turn around. The second generation CTS takes the original’s solid grounding and builds on it to the point where it is now a match for just about any luxury marque – European or not. As with the original, the new CTS features Cadillac’s art and science design language. This time around, however, rather than being all about sharp edges, it has substance and personality – at night, for example, the interior and exterior lighting is stunning. It all speaks to the hardware found beneath the sheet metal. In base form, the CTS is powered by a 3.6L V6 that’s married to a six-speed manual or optional three mode (normal, sport and manual) six-speed automatic. For most, the 263 horsepower and 253 pound-feet of torque will be enough to satisfy – it is a smooth engine that makes all the right noises when punched. The better choice is the direct injection version of essentially the same engine. Squirting the fuel into the cylinders at 1,750 psi ups the stallion count to 304 and torque production to 273 lb-ft. The bigger difference, however, is found in the torque plateau – upward of 225 lb-ft of torque is available from 1,500 rpm. When married to the six-speed manumatic and its low first gear, the launch off the line is very impressive. Both engines are offered with an optional all-wheel drive system. Under normal circumstances it fires 75% of the drive through the rear wheels and 25% to the front. If slippage occurs, the system shuttles the power about in a seamless manner. Matting the gas on a gravel road produced little drama – the combined effects of the AWD system and traction control delivered a spin-free takeoff. Where the new CTS really shines is in its handling – the stiff chassis, 50-mm wider track (up to 1,570-mm) and a serious suspension brings a blend of ride and handling that’s well suited to just about any customer. The reason is simple – there are three distinctly different suspension setups. The base FE1 suspension focuses more on comfort than handling, although it is still pretty good when pushed through a fast sweeper. The FE2 package brings much less body roll and better steering feel without giving up on comfort. Upgrading the rubber from the stock P235/55R17 to the P235/50R18 package is worth the money. The FE3 setup, as far as I’m concerned, is the only way to go. It banishes body roll, brings a much sharper responsive to steering input and has gobs of grip thanks to the y-rated P235/50R18 Michelin Pilot Sports PS2s. This setup is the cat’s meow, and works equally well in town or on the twisty back roads around Carmel. To demonstrate just how effective the FE3 suspension is Cadillac opened Laguna Seca raceway for some open lapping. Now this track is a serious test of both man and machine. There is a lot of elevation change, tons of hard braking, a long, fast straight and the famous Cork Screw – it starts with the equivalent of a four-storey drop out of a sharp corner and then winds downhill through a series of pretty serious twists and turns. It is not for the faint of heart – nor is it a place for marginal machinery. The FE3-equipped CTS handled everything thrown at it and then some. There’s very little brake fade, plenty of power (that’s accompanied by a glorious exhaust note) and a tenacious turn-in at the end of it all. In fact, the only wart that surfaced was the lack of paddle shifters – it would improve both the road and track experiences enormously. The exterior elegance is mirrored within the cabin, especially in the models with the two-tone black/light titanium finish. The soft-touch materials, complete with French stitching on the dash and doors, are top notch. There’s also a wealth of equipment. The optional audio/navigation system package delivers superb sound. Along with all the usual plug-ins and CD slots comes a 40-gig hard drive that has a neat trick – it records up to 60-minutes of radio feed. This allows you to pick up a live broadcast the next time you drive the car. Being a fan of live radio, I invariably find myself sitting in the driveway to catch the end of a piece. Not any more! As for peeves, there are few. The navigation screen rises up from the top of the centre stack where it washes out too easily in bright sunlight because of the elevated location. The climate control’s temperature readout sit by the driver’s right knee, which is a long way down from where it’s expected and the D for drive is a bright, eye-catching red – warning lights are the only things in the instrumentation that should be that colour. In all, pretty small stuff. The hallmark of a good car is the ability to drive it for a coupe of hours without suffering from a numb bum and the fatigue this brings. The 2008 CTS not only accomplished this with ease, it handled Laguna Seca without so much as missing a beat. Cadillac is back and now represents a formidable force in the sporting luxury class. In short, if Cadillac can put bottoms in those comfy seats, the CTS will sell itself. 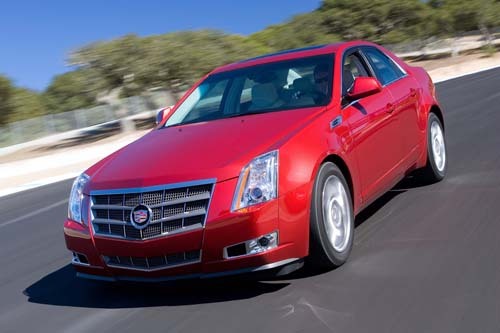 The CTS starts at $38,900 and rises to $41,400 when equipped with the premium direct injection engine.